MTV Moscow reported the band's visit to the city in October. The clip has various footage from the DOM gig, and the interview of the members. Started at 11:45. Duration - about 3 minutes. At last! It's just officially announced. The regular year's-end concert of Hikashu will be held on December 23 at Daikanyama Unit, Tokyo, with a lot of guest - this year almost all women musicians. 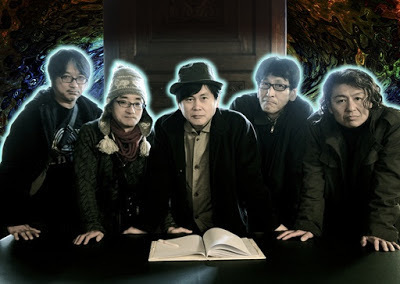 As for guests, Inoue Makoto is the leader of Godzilla Legend, a project aiming reinterpretation of music from classic monster movies, founded in 1982. He is an original member of Hikashu as well. Although quitted the band in 1991, he has been a collaborator afterwards on and off. He is also a member of Inoyama Land, an ambient music duo with Yamashita Yasushi, another original Hikashu. Their partnership even predates Hikashu, started in 1977. Marianne Shinonome is the leader and vocalist of all-girls rock combo, Kinoco Hotel. She's been known as a fan of Hikashu and spotted at the band's gig frequently. Charan Po Rantan is a sister's duo, consisted of Koharu (accordion, vocals) and Momo (vocals). At the year's end concert of Hikashu last year, they did a short set of their own, then performed with Godzilla Legend. In the Godzilla set, they played Shobijin, which is originally the role by the Peanuts (wikipedia), a legendary figure and another sister's duo. They sang two tunes - the famous theme from Mothra, and "The Sacred Fountain," a beautiful ballad with haunting chorus, which they reproduced splendidly. This time they bring a drummer and long-time associate, Fuu'chin. 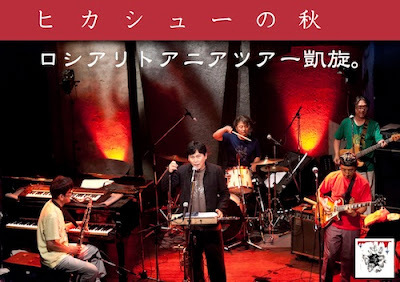 Ishiwata, Nakamura, and Kaneko are all musicians active in Tokyo area, playing with various jazz and pop ensembles. The last year's-end concert with Godzilla Legend was quite a monumental, so will be this year's absolutely. Go buy ticket not to be remorse. "Hikashu no Christmas Kaiki Daisakusen 2012"
The first gig after the tour, therefore some road stories are expected. This is the only Hikashu appearance in November as well, so do not miss it. 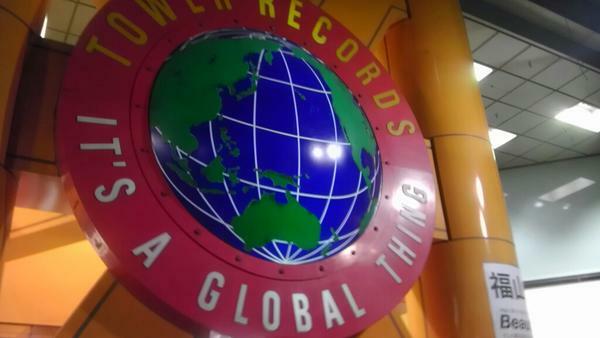 They've still made a little comment about the trip but judging from it, the tour was quite fantastic. In Moscow and Vilnius, they played in front of jazz audience and got enthusiastic response. In Riga, Latvia, they visited the JZ Microphone factory and utterly impressed by their professionalism and commitment for quality. Riga is also a town of beauty and they would like to return some day. Sankt Peterburg is the place where it was the first time for all members, even Makigami, to be there. Beside two performances (which turned out great), the city was up to their expectations indeed. They went to see the Museum (need not to mention where), and some monuments for the great figures of Russian literature, that is, to be more precise, Dostoevsky and Nabokov. Overall, it seems to be a great tour and great experience. More road stories are expected at their next gig on November 7 at Star Pine's Cafe, Kichijoji, Tokyo. Unfortunately, drummer Sato couldn't make it, but other than that, it was success. It was the first time appearance for them in Tokyo since September so the place was packed. The band did a nearly one-hour set, mostly the numbers from their latest album, Uragoe. At first, the absence of the drummer was evidently affected the performance. Surprisingly, the number they picked for the first tune was "Fude o Fure, Kanata-Kun" [Wave the Brush, Mr. Beyond] which is a heavily rhythmical composition. Naturally, it turned out to lack something desired and sound so strange, though it showed the band's fearlessness. But after that, the band got used to the situation, and the audience seemed to overcome its uneasiness and started cheering. They even did an encore. After the main set, the audience wanted more. After the band returned to bandstand, several in the audience shouted Pike. They took it and played the tune, backed with the crowd clapping enthusiastically. After the performance, there's a long line of fans with albums, waiting to be autographed. It is the second time he visit the Republic in Siberia this year. He invited to join a pop music festival held in Kyzyl, the capital city of Tuva. His appearance will be at The Drama Theater on December 1, 2012. Go see him if you were nearby.